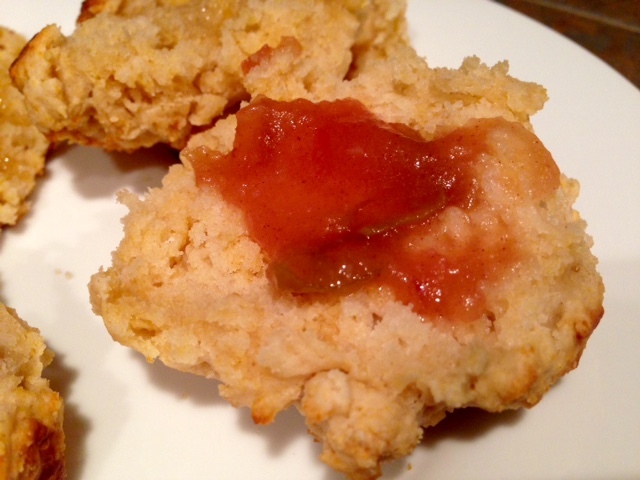 These biscuits are SO easy and SO good! It’s no secret that I adore biscuits. They’re buttery and flaky and warm, you can put jam and honey on them, and they feel so good in my belly! But there are two things about biscuits that I don’t love. I really hate having to cut cold butter into flour—it may be irrational, but I really hate it. And while biscuits are amazing straight out of the oven, they’re usually dense, dry balls of bread that get stuck in your windpipe and try to choke them to death when you eat them as leftovers. These use melted butter, and stirring everything together takes a couple minutes tops. 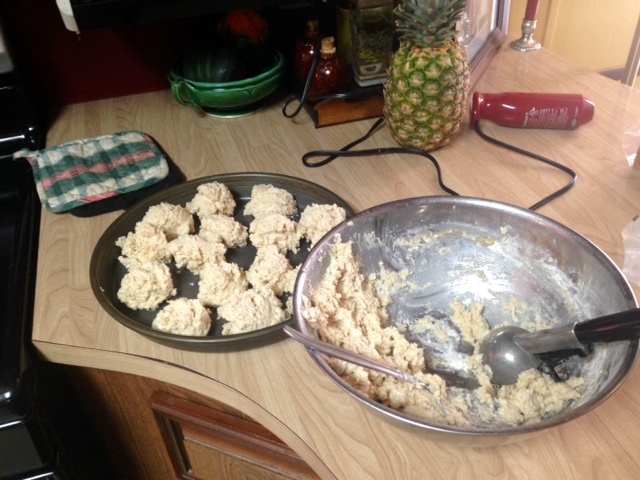 You get this shaggy dough that you can use a spoon or ice cream scoop to plop directly into the pan, so no cleanup from having to roll out and cut the biscuits. And the taste and texture! 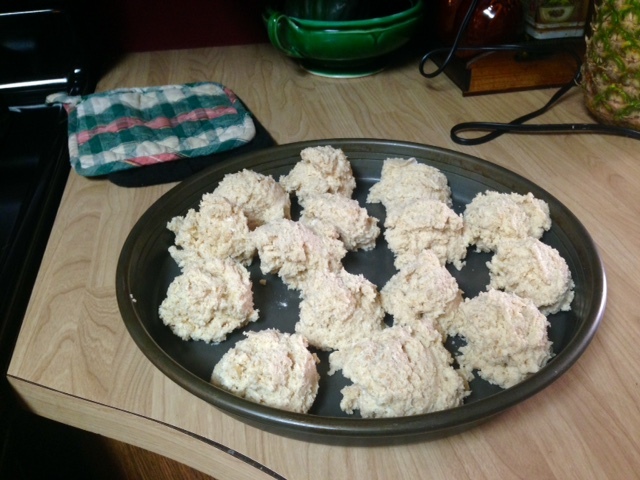 Not only are they amazing right out of the oven, but we re-heated them for dinner that night and scarfed the last couple the next morning, and they still were light and fluffy as leftovers. So basically perfect. Pre-heat the oven to 475° F. Melt the butter and allow it to cool for 5 minutes while you assemble the other ingredients. Stir together the dry ingredients in a large bowl. In a separate bowl, combine the buttermilk, melted butter and honey. If you’re lazy like me and don’t want to dirty up another bowl, you can just pour them directly into the dry ingredients. Stir until just combined. You’ll have a shaggy, wet dough which should just barely pull away from the side of the bowl. 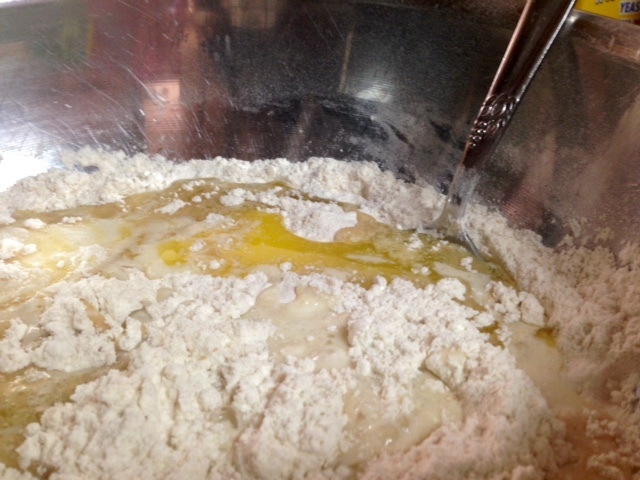 If you used some whole wheat flour, you may need to add a little extra buttermilk if your dough is too dry. Use a lightly greased 1/4-cup measure or big ice cream scoop (or just a big spoon) to scoop out portions and drop onto an ungreased 9-10” round pan or cast iron skillet. You should have roughly 9 biscuits around the outside and 3 in the middle of the pan. Bake until the tops are golden, about 13-15 minutes. 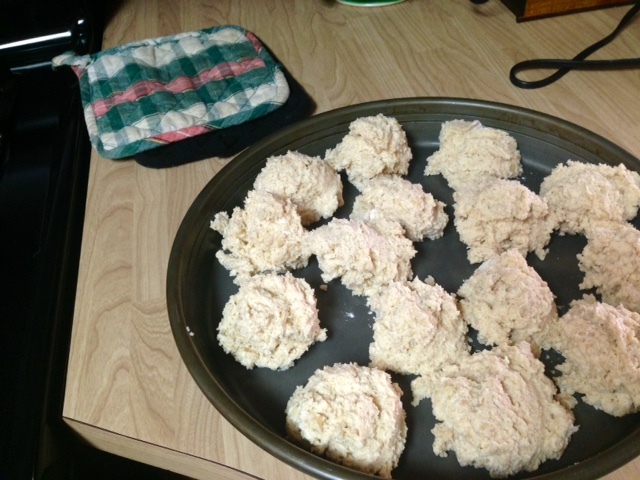 Melt the other 2 tablespoons of butter, and when you pull them out of the oven, brush the tops of the biscuits with it. Allow to cool 5 minutes before before serving. Serve hot, with whatever condiment strikes your fancy—I’m partial to honey myself, but had some homemade apple butter on hand as well. Store the leftovers in an airtight container or sack, then reheat before eating. 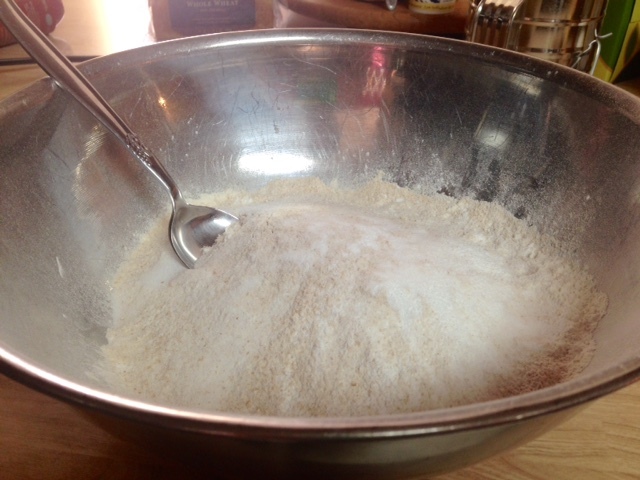 Stir together the flours, baking powder, salt and baking soda in a large bowl. In a separate bowl, combine the buttermilk, melted butter and honey (or if you don’t want to dirty up another bowl, just add directly to the dry ingredients). Stir well. 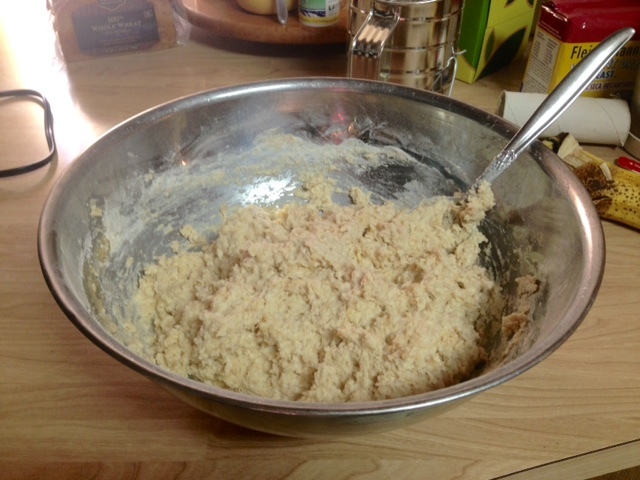 You’ll have a shaggy, wet dough, you want it to just barely pull away from the side of the bowl. Use a lightly greased 1/4-cup measure or big ice cream scoop to scoop out equal portions and drop onto an ungreased 9-10” round pan or cast iron skillet. You should have roughly 9 biscuits around the outside and 3 in the middle of the pan. Bake until the tops are golden, about 13-15 minutes. 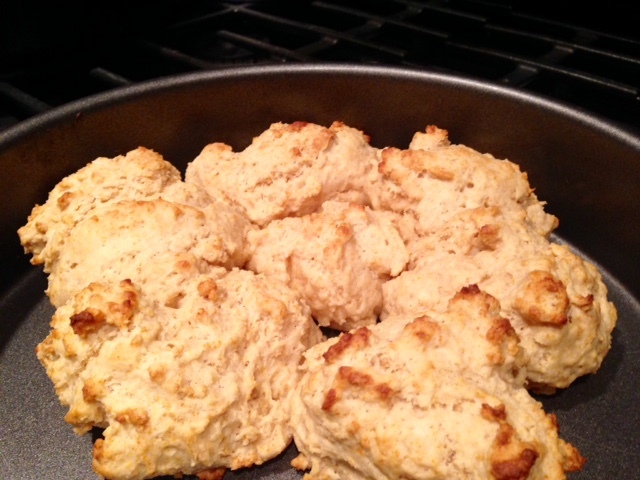 When you pull them out of the oven, brush the tops of the biscuits with the 2 tablespoons of melted butter. Allow to cool 5 minutes before before serving. * To make my own cake flour, you can just remove 2 tablespoons of flour per cup and substitute with 2 tablespoons of cornstarch—then sift WELL. Wow, these are fabulous! We just used them on top of pot pie (in place of piecrust) and we’re already planning another batch for brunch tomorrow morning! I used freshly-ground whole wheat flour, but I didn’t reduce the amount called for because instead of buttermilk, I just added a few tablespoons of vinegar to two cups of milk and let it sit for 10 minutes to sour. I figured the whole wheat flour and buttermilk substitute would more or less cancel each other out, and they did! We couldn’t stop stuffing our faces with the extra biscuits, even after we’d finished our pot pie (because I’d made a double-batch of the dough and dropped the excess batter onto a separate cookie sheet while the pot pie was baking). I skipped the butter brushing at the end because it seemed unnecessary and the batter is already so buttery. Glad you liked! 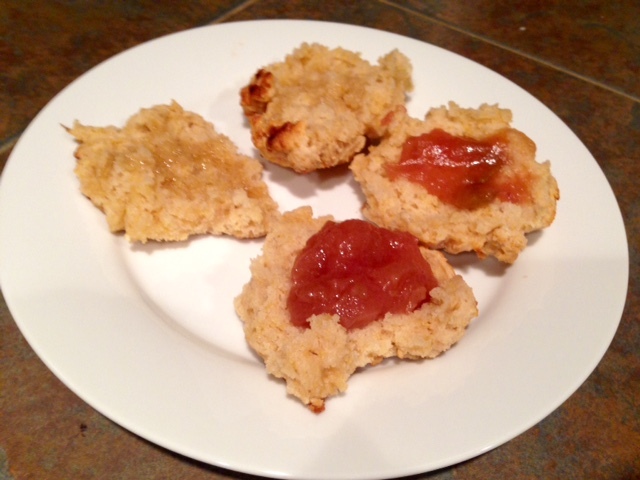 I looooved them–made them alone but then on top of pot pie (using part whole wheat flour) and they’re just so good, so easy, and way better as leftovers than regular biscuits. We made these again this morning and realized that they would also be awesome with a bunch of cheddar cheese mixed in. 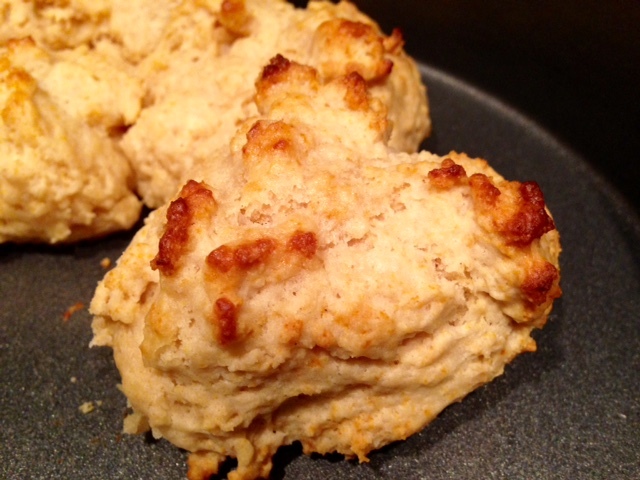 They’d be a pretty close (healthier) copycat recipe for Red Lobster’s cheddar biscuits.